TEPCO finished the fortification job for the Spent Fuel Pool in Reactor 4 on July 30. Now, according to NHK News Japanese (7/31/2011), TEPCO is going to conduct a test run of the heat exchanger that it also finished installing for the SFP. The company hopes to lower the temperature of the SFP from the current 87 degrees Celsius to about 30, just like in Reactors 2 and 3. The carbon-based workers had to carry everything up the stairs in full radiation protection suits and full face masks and do the work in high radiation. It'd better work, and it'd better be a step forward. One pump stopped at Kurion's unit of the contaminated water treatment system, and TEPCO decided to stop the transfer of the contaminated water from Reactors 2 and 3, as the Central Waste Processing Facility (where the water is stored before treatment) is nearing the capacity (20 centimeters from the limit), according also to NHK News Japanese (7/29/2011). Hitachi's desalination unit is stopped due to a water leak, although the water treatment to remove radioactive materials continues uninterrupted. TEPCO conducted the air sampling from inside the Containment Vessel in Reactor 1, expecting the very high density of radioactive materials, but the result, after workers got max 5 millisieverts for the work on July 29, shows the air inside the Containment Vessel is just as clean/dirty as the air outside the Containment Vessel. TEPCO was expecting the air inside the CV to be 1,000 times as contaminated as the air inside the reactor building (but outside the CV). So, what are the possible reasons as to why the air inside the CV is no different than the air outside? TEPCO's Matsumoto thinks it may be because cesium tends to dissolve into water. Or it could be that all that was inside the CV blew out and was gone when the reactor building blew up. It could also be because the corium has long gone from the Containment Vessel and deep into the concrete (I hope) that it doesn't affect the air very much any more. Remember TEPCO hasn't done (or released) the testing of the water in the basement of Reactor 1 reactor building, and that water was gushing in steam which measured 1,000 millisieverts/hour. Something very hot (temperature and radiation) is under that water. TEPCO has been sending in workers to Reactor 1 regardless, to install the heat exchanger for the Spent Fuel Pool. That, by the way, is another thing that hardly any information has been released by TEPCO: the SFP of Reactor 1. What's the radiation level of the water in the pool? What happened after the explosion? What's the temperature of the water? What happened to the spent fuels? Radiation? Who knows. One irony of the radioactive fallout from Fukushima I Nuke Plant is that people in Japan have started to pay much more attention to nature around them. So they may be noticing things that was on-going even before the accident. Or they may not. These are the pictures taken on the sidewalk on Hakusan Dori in Bunkyo-ku in Tokyo, and uploaded on July 30. The air radiation in Bunkyo-ku has been higher than the official Tokyo number (measured in Shinjuku-ku, western central Tokyo), along with several other eastern "ku" (special wards of Tokyo). The person who took the pictures says, "About 30% of azaleas on the side walk are completely dead. Ginkgo leaves are browning." Japanese Military Analyst: Chinese Nuclear Submarine Accident in Dalian, China?? and radiation is leaking, the analyst says. He also mentions the high-speed train accident, and says there are 259 people dead so far. It was reported by Mamoru Sato on his blog on July 30. I have no idea who he really is, but the bio on his blog says he was a fighter pilot in the Self Defense Air Force of Japan, and was then a high-ranking officer and the commander of the several major air force bases in Japan until he retired from the service in 1997. Checking the biography in Wiki, it looks like he is indeed what he says he is. According to the information I just obtained, a nuclear submarine of the Chinese Navy had an accident in the port of Dalian on July 29, and there is a leak of radiation. The area is strictly closed off by the Chinese military, and the situation is said to be very dangerous. I doubt that the Chinese government will announce the accident. The neighboring countries should take defensive measures, and the Japanese fishing boats in the area should be careful. One more thing. According to a "foreign" insurance company, China's high-speed train accident has 259 people dead, 183 injured, and 154 still missing. The numbers are set to increase, according to this insurance company. The families of the victims continue to protest, and I've wondering about "missing" people. Now I begin to see why the Chinese government hastily doubled the compensation for the victims. China's "hiding the accident" is well beyond that of Japan. Anyway, the Ministry of Foreign Affairs and the Japanese media should try to obtain more information about China's "nuclear leak accident". It is inevitable that a Chinese-made nuclear power plant will have an accident, and I'm concerned about the next year's "yellow sand" season. Just to let you know the news quickly. I don't know if China's "hiding" is any worse than that of Japan, but if I see any confirming information I'll update. After the Fukushima I nuclear accident, it dawned on many Japanese (probably for the first time) that almost entire Japan is DOWNWIND from China, who plans to have 100 nuclear power plants. And thanks to the Fukushima accident, many Japanese now know it's not the distance that matters when it comes to a nuclear power plant accident, but wind and weather. Iwaki City is about 43 kilometers south of Fukushima I Nuclear Power Plant. According to the Nuclear and Industrial Safety Agency, there has been no report of any damage at Fukushima I and Fukushima II. The M6.4 earthquake hit at 3:54AM Japan Standard Time on July 31. It was felt throughout Hokkaido, Tohoku, Kanto, and Chubu (eastern half of Japan). Naraha-machi, where Fukushima II Nuke Plant is located, had the seismic intensity of 5+. The earthquake was followed by several aftershocks in the same area and Hokkaido. Video with English Caption: Professor Tatsuhiko Kodama of Tokyo University Tells the Politicians: "What Are You Doing?" Please share the videos with your non-Japanese-speaking friends. Original written posts are here: Part 1, Part 2, Part 3. There are also French translation and German translation (video subtitle), thanks to the readers of this blog. It's attracting far less attention, but the radioactive leaf compost is getting to be like the radioactive beef. First, it was 20,000 bags sold in Akita. Then, an unknown number of bags sold in Tottori (link in Japanese). Now it turns out 200,000 bags of the radioactive leaf compost from a retailer based in Gunma Prefecture have been sold at least in 23 prefectures, Tottori included, at the retailer's 166 outlets throughout Japan. Home gardeners in 23 prefectures ended up irradiating their garden soil. Tottori Prefecture announced on July 27 that 14,800 becquerels/kg of radioactive cesium was detected from the leaf compost sold at a home/garden center "Cainz Home FC" in Tottori City. According to the Prefecture and Cainz Ltd (headquartered in Takasaki City, Gunma Prefecture), the leaf compost is sold under the company's private brand. The compost is made of plants from Tochigi and Iwate Prefectures, and from Thailand and Vietnam. It is made by a manufacturer in Kanuma City in Tochigi Prefecture. Since the March 13 earthquake/tsunami, 130,000 14-liter bags and 70,000 3-liter bags have been sold at the company's 166 stores in 23 prefectures. The radiation level at 1 centimeter from a 14-liter bag was 0.7 microsievert/hour. No radiation was detected in a 3-liter bag. Well, you can see the surging water and pouring rain, so the government can order or recommend evacuation to this many people on a very short notice and people will oblige. Too bad radiation cannot be seen - "invisible snake". Local governments in Niigata and Fukushima prefectures on Friday issued evacuation advisories to thousands of residents due to record rainfall in the two prefectures. The Japan Meteorological Agency said some areas in Niigata and Fukushima prefectures saw precipitation of about 100 millimeters per hour and warned of continued torrential rain in the two prefectures through Saturday morning. Evacuation order and recommendation has been issued to about 320,000 residents in Niigata and Fukushima Prefectures due to the heavy rain. In Niigata Prefecture, the levee broke along the Igarashi River in Sanjo City, necessitating the order to evacuate for 10,000 residents. So far, 369,000 residents in 12 cities and towns in Niigata have been ordered or advised to evacuate. 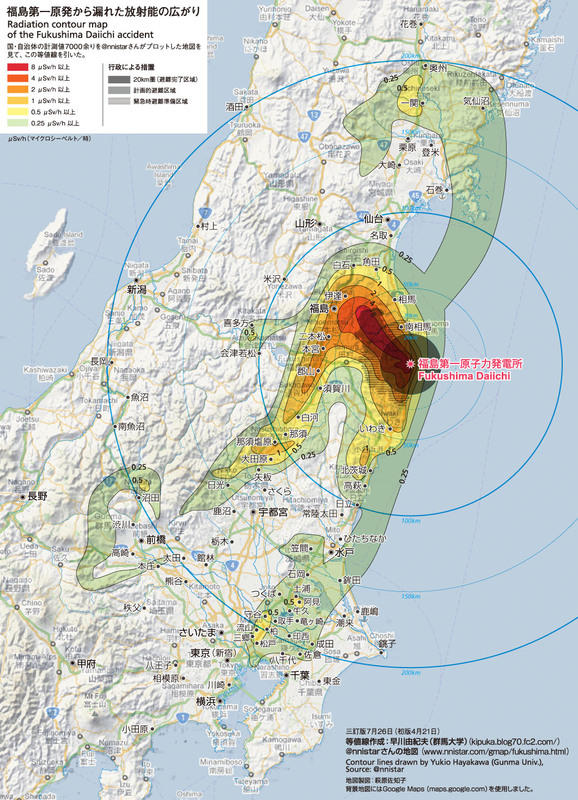 In Fukushima Prefecture, 6,700 residents in 7 towns are ordered or advised to evacuate. The total number of affected households in two prefectures is 126,000, or 375,000 residents. In Fukushima, it's the Aizu region that is affected, which is the west one-third of Fukushima Prefecture. After the March 11 earthquake and tsunami devastated the Tohoku region in Japan’s northeast, the central government evacuated as many as 470,000 residents, including 160,000 because of radiation risks from the crippled Dai-Ichi nuclear plant. More than 2 million residents including 271,000 children remain in Fukushima, Japan’s third-biggest prefecture by size. The government is closely monitoring radiation levels, said Yoshiaki Ishida, an official at the Ministry of Education. “We don’t think we are at a stage to tell Fukushima people to evacuate at this moment,” Ishida said. Kiyoharu Furukawa, 57, assistant principal at Fukushima Nishi High, said the school told Shishido not to spend too much time talking about radiation during his classes as some students and parents complained. He confirmed Shishido resigned. Radiation can damage human cells and DNA, with prolonged exposure causing leukemia and other forms of cancer, according to the World Nuclear Association. Children are more susceptible as their cells grow at a faster rate. Shishido will leave Fukushima for Sapporo, on the northern island of Hokkaido, on Aug. 8 to join his wife and two children aged 13 and 10, he said. The teacher aims to create a network there to help the 3,000 evacuees from Fukushima find jobs. Hokkaido is offering 2,140 apartments in public housing, some rent-free, to evacuees from Fukushima, Miyagi, Iwate and other prefectures affected by the quake and tsunami, said Toshifumi Imai, a Hokkaido housing official. The government also offers loans of as much as 500,000 yen ($6,400) without interest, he said. Shishido said he was instructed by school officials not to tell his students that they should wear masks or about how radiation would affect their health. He deleted some comments from his blog after receiving those orders in May. A group of parents and children from Fukushima plan to visit Education Minister Yoshiaki Takaki in Tokyo on Aug. 17 to ask him to evacuate children from the prefecture, she said. Fukushima Nishi High, which has 873 students, had readings of 0.07 microsieverts per hour in the school building and 1.5 microsieverts per hour in the playground on July 14, still within the safety limits set by the prefecture and government, Furukawa, the assistant principal said. The school continues to hold gym classes and sports club activities outside, he said. An official at the Fukushima Prefectural Board of Education, who didn’t want to be identified, said he was surprised that Fukushima Nishi High clamped down on Shishido’s views. The board has sent counselors to the 301 schools it oversees to ensure that children are not suffering from mental problems, the official said. The board also asks students and teachers to wash their hands and gargle after playing outside, the official said. About a fifth of the 1,600 schools in Fukushima are exposed to at least 20 millisieverts of radiation a year, the Network to Protect Fukushima Children from Radiation said, citing the most recent government readings in April. That’s the limit for an atomic plant worker set by the International Commission on Radiological Protection. More than three-quarters of the schools receive radiation readings of 0.6 microsievert per hour, said the network, a group comprising 700 parents. That’s 10 times more than the readings in Shinjuku, central Tokyo, on average. Miyuki Sato, a 36-year-old housewife who evacuated to Kyoto this week with her two children, attended a town hall with government officials in Fukushima on July 19. She said that even after leaving her home, she still has a 120,000 yen monthly mortgage to pay off. - The teacher, Mr. Shishido, had been warning his students about radiation danger UP TILL the end of May, when he was told to stop. "It's just too hot to be afraid of radiation." Fukushima is very hot during summer, that's for sure. "Let me say something to people who say the radiation risk is just the matter of probabilities. Are you willing to let your children participate in a game of Russian roulette?" Also sad is the assistant principal at the high school where Mr. Shishido has taught for 25 years. He knows the radiation is high in the school yard, he knows that children should be taking precautions like wearing long-sleeve shirts and masks. But he doesn't stop the outdoor activities because the Ministry of Education says it's safe below 3.8 microsieverts/hour. Instead of telling students to take precautions the school pressured Mr. Shishido to resign, citing parents' complaints. (Part 3) Professor Tatsuhiko Kodama of Tokyo University Tells the Politicians: "What Are You Doing?" Again, what's happening to Minami-Soma clearly shows that 20 or 30 kilometer radius [from the nuke plant] doesn't make any sense at all. You have to measure in more detail like measuring each nursery school. What's most problematic is the government's policy that they will compensate the residents for the moving cost only if their areas are designated as official evacuation zones. In a recent committee held at the House of Councilors [Upper House], President Shimizu of TEPCO and Mr. Kaieda, Minister of Economy, Trade and Industry answered that way. I ask you to separate the two immediately - compensation criteria issue and children's safety issue. Another thing is, what I strongly feel when I'm doing the decontamination work in Fukushima is that emergency decontamination and permanent decontamination should be dealt with separately. We've been doing a lot of emergency decontamination work. For example, if you look at this diagram, you will notice that the bottom of this slide is where small children put their hands on. Every time the rain streams down the slide, more radioactive materials accumulate. There can be a difference in radiation level between the right side and the left side. If such difference occurs and if the average radiation of the slide is 1 microsievert, then one side can measure as high as 10 microsieverts. We should do more emergency decontamination work in such places. Then, how much will it cost when you seriously do the decontamination work? In case of "Itai-Itai Disease" caused by cadmium poisoning, to decontaminate half of cadmium-contaminated area of roughly 3,000 hectare, the government has spent 800 billion yen so far. So, I'd like to make four urgent requests. First, I request that the Japanese government, as a national policy, innovate the way to measure radiation of food, soil, and water, through using the Japan's state-of-the-art technology such as semiconductor imaging detectors. This is absolutely within Japan's current technological capability. Second, I request that the government enact a new law as soon as possible in order to reduce children's radiation exposure. Right now, what I'm doing is all illegal. The current "Radiation Damage Prevention Law" specifies the amount of radiation and the types of radionuclides that each institution can handle. Now Tokyo University is mobilizing its workforce in its twenty-seven Radioisotope Centers to help decontaminate Minami-Soma City, but many of the centers don't have a permission to handle cesium. It's illegal to transport it by cars. However, we cannot leave highly radioactive materials to mothers and teachers there, so we put them all in drums and bring them back to Tokyo. To receive them is illegal. Everything is illegal. The Diet is to blame for leaving such situations as they are. There are many institutions in Japan, such as Radioisotope Centers at national universities, which have germanium detectors and other state-of-the-art detectors. But how can we, as the nation, protect our children if these institutions' hands are tied? This is the result of the gross negligence by the Diet. We don't have the luxury to spare a single second considering the financial condition of the Japanese government. We must figure out how we really do the decontamination work. Professor Tatsuhiko Kodama is the head of the Radioisotope Center at the University of Tokyo. On July 27, he appeared as a witness to give testimony to the Committee on Welfare and Labor in Japan's Lower House in the Diet. Remember Professor Kosako, also from the University of Tokyo, who resigned in protest as special advisor to the prime minister over the 20 millisievert/year radiation limit for school children? There are more gutsy researchers at Todai (Tokyo University) - the supreme school for the "establishment" - than I thought. Professor Kodama literally shouted at the politicians in the committee, "What the hell are you doing?" He was of course referring to the pathetic response by the national government in dealing with the nuclear crisis, particularly when it comes to protecting children. Even if you don't understand the language, take a look and listen. He sounds sincere, and his voice is literally shaking with anger. "We detected 5 microsieverts/hour radiation in Tokai-mura in Ibaraki Prefecture about 9AM on March 15, and notified the Ministry of Education and Science as the "Article 10 notification" [as specified in the Nuclear Disaster Countermeasures Law]. Later, the radiation exceeding 0.5 microsievert/hour was detected in Tokyo. Then on March 22 it rained in Tokyo, and with the rain came 0.2 microsievert/hour radiation, and this I believe is the reason for the elevated radiation level to this day. "Chief Cabinet Secretary Edano said at that time, "There is no immediate effect on health". I actually thought this was going to be a big, big problem." It was indeed in the news that 5 microsieverts/hour radiation was detected at Tokai-mura in Ibaraki Prefecture on March 15 morning, but hardly anyone, other than nuclear experts like him, connected that news with the elevated radiation level in Tokyo. The residents of Tokyo didn't even know about it. What happened in the morning of March 15? Well, Reactor 4 at Fukushima I Nuclear Power Plant had a "big noise" which blew out the roof at 6AM, and Reactor 2 had an explosion in the Suppression Pool at 6:14AM. Or it could be from the Reactor 3 explosion in the previous day, at 11:01AM on March 14. "Why was I concerned? Because the current radiation injury prevention method is based on dealing with a small amount of radioactive materials that emit very high radiation. In this case, the total amount of radioactive materials is not much of an issue. What matters is how high the radiation is. "However, in the case of the Fukushima I Nuclear Power Plant accident, 5 microsieverts within 100-kilometer radius [he is referring to Tokai-mura], 0.5 microsievert within 200-kilometer radius [referring to Tokyo area], and the radiation extended far beyond, even to teas in Ashigara and Shizuoka, as everybody now knows." "When we research the radiation injury/sickness, we look at the total amount of radioactive materials. But there is no definite report from TEPCO or the Japanese government as to exactly how much radioactive materials have been released from Fukushima. "So, using our knowledge base at the Radioisotope Center, we calculated. Based on the thermal output, it is 29.6 times the amount released by the nuclear bomb dropped on Hiroshima. In uranium equivalent, it is 20 Hiroshima bombs. "What is more frightening is that whereas the radiation from a nuclear bomb will decrease to one-thousandth in one year, the radiation from a nuclear power plant will only decrease to one-tenth. "In other words, we should recognize from the start that just like Chernobyl, Fukushima I Nuke Plant has released radioactive materials equivalent in the amount to tens of nuclear bombs, and the resulting contamination is far worse than the contamination by a nuclear bomb." "When a vast amount of radioactive materials is released, they are in particles. Dispersion of particles is non-linear, and it's one of the most difficult calculations in the fluid dynamics. The nuclear fuel is like sands buried in synthetic resin, but once the fuel melts down, a large amount of super-fine particles is released. "What happens then? The problem like the contaminated rice hay happens. The pattern of contamination does not follow concentric circles. It depends on the weather. It also depends on where the particles landed - on the material that absorbs water, for example." "We at the Radioisotope Center have been helping Minami Soma City in the decontamination effort. We've done seven decontaminations so far. When we went to Minami Soma for the first time, there was only one geiger counter. On March 19 when the Ministry of Agriculture, Forestry and Fisheries supposedly issued the notice [on the cattle feed], food, water, and gasoline were about to be depleted in the city. The mayor of Minami Soma made a plea for help on the Internet, which was widely viewed. "In that kind of situation, no one would look at a piece of paper from the Ministry, no one would know. Farmers didn't know that rice hay was in danger. Still, they bought the feed from abroad, paying hundreds of thousands of yen, and started to feed the cows with the same groundwater that they drank. "So, what should we do now? We have to guarantee that the thorough radiation measurement is done in the contaminated area. As I said before, there was only one geiger counter in Minami Soma City when we went there in May. In fact, there were 20 personal survey meters provided by the US military. But no one at the city's Board of Education could understand the English manual until we went there and told them how to use them. That's how it is there. "As to the food inspection, there are more advanced survey meters than germanium counters, such as semiconductor detectors. Why doesn't the Japanese government spend money in supporting [the development of these advanced detectors?]? "After 3 months, the government has done no such thing, and I am shaking with anger." I still remember the bizarre photograph of residents of Tokyo listening to the speech by a candidate during the local elections back in April. With radioactive fallout falling on them with rain, they were listening to the candidate with masks on. The determination of the authorities to carry on what had been planned before the Fukushima I's reactor buildings blew up, and the citizens' willingness to go along with it, as if nothing had happened. Extend and pretend. This is the measurement of radiation before the ballgame in Fukushima Prefecture on July 13. NHK, who broadcast the game live, showed this during the game. Since the highest was less than the "safety" limit of 3.8 microsieverts/hour that the Ministry of Education decided, the game was on. None of the games anywhere has been canceled due to the radiation concern. In fact, the final game to decide the Fukushima representative to the national tournament was played in the rain on July 28. A Christian school located in the high radiation Date City won, and will represent Fukushima Prefecture in the national tournament held in Osaka. The Japanese did the spring tournament also, right after the Fukushima accident. They didn't even measure the radiation back then. Big money at stake in the high school baseball. Many top players come from outside the prefecture to play for the schools with strong baseball programs. Radiation be damned. 11 TEPCO employees entered the Reactor 3 reactor building on July 27 to measure radiation in locations where they would need to work in order to switch the water injection point to the ECCS pipe for more efficient "cooling" of the "fuel in the RPV". They also managed to measure the radiation level on the stairs leading up to the 3rd floor, and it was even higher than on the stairs to the 2nd floor, almost twice as high. One of Fukushima workers who tweets is worried about plutonium in the reactor building. He also said some time ago that the emergency radiation limit for the workers at the plant of 250 millisieverts was applied only to TEPCO employees in practice, while most of the subcontractors were limiting their workers' cumulative radiation below 100 millisieverts. TEPCO has been sending its own employees to the areas with very high radiation. But when it comes to actually installing pipes and equipment, it will likely be the subcontractors who will have to do the job. It will be people like Mr. Watanabe who was interviewed by The Independent. I don't think TEPCO employees know much about plumbing. 1 minute of work at that highest radiation location, and you will get 2.8 millisieverts. after more than 4 months of radioactive fallout, because the Ministry of Agriculture, Forestry and Fisheries has finally issued a notice that it would be better not to use leaf compost. Another lesson in importance of thinking on your own and not depending on the authorities in Japan and elsewhere. After radioactive cesium was detected from the leaf compost, the Ministry of Agriculture, Forestry and Fisheries issued a notice to withhold use and shipment of compost on a voluntary basis. Accordingly on July 27, City of Kamakura stopped the distribution of free compost to the residents. The city collects yard waste - pruned twigs and branches from the residents and commercial gardeners - in order to reduce and recycle waste. The yard waste is shipped to Yamanashi Prefecture and is composted there. Such pruned twigs and branches amount to 11,000 tonnes per year. The compost is distributed free of charge to the residents at 8 locations in the city. Last year, 2,100 tonnes of compost were distributed. The city decided to stop the distribution until the national government comes up with a standard for compost, and notified the residents on the city's homepage. For the time being, the city still collects the yard waste from the residents, but will decide what to do with the composting. The city is also doing its own analysis of the compost to see if radioactive cesium is detected. Among the participants was Mr. Takumi Aizawa, a school worker at Kusano Elementary School in Iitate-mura in Fukushima Prefecture, which has been designated as "planned evacuation zone" by the national government. Mr. Aizawa told the demonstrators, "After the earthquake there was no information. Then a university professor sent by the government came to the village and said, "You can eat vegetables harvested in the village if you wash them". Children, who had been evacuated, then started to come back [on that reassuring word] and they got irradiated." What? And who was this professor? I suspected Dr. "100 millisieverts" Yamashita, but it turned out to be his younger sidekick, Dr. Noboru Takamura of Nagasaki University. The powerful duo was all over Fukushima Prefecture in March and early April, preaching "safety" of radiation and radioactive fallout to the worried residents of Fukushima as the official radiation advisors for the prefecture. Thyroid cancer from radioactive iodine only affects children and young mothers. People over 40 do not need to worry. Wear a mask outside, and wash your hands when you come home, and you'll be OK. There will be no ill effect on health living in the village as long as you observe basic hygiene. Nagasaki University Graduate School Professor Noboru Takamura said during the April 6 meeting in Iitate-mura to explain the risk of radiation, "Rain and typhoon will quickly wash away the radioactive materials. If the radiation is below 10 microsieverts/hour, it's safe even for children." Right after the disaster, the professor who was probably asked by the Fukushima prefectural government said in the lecture in Fukushima City, "it's safe up to 100 millisieverts". People in Fukushima were relieved. No one doubted the professor. The recording of the lecture was played everywhere endlessly - radio, inside the buildings, on the street. There must be many in the countryside who still believe him. They don't have enough information. I returned to Fukushima on March 21, the day of that lecture. I spoke with friends on the phone, and they had gone to that lecture, looking for any information. He spoke in a reassuring manner, and the lecture was dotted with loud applause. The recording was played every single day at the building where our recovery support group is located. Outside Fukushima City, after Professor Yamashita's safety lecture, the content of the lecture was re-printed in the local PR pamphlet. There were also handouts distributed in the neighborhood, in schools.. The message was played by USTREAM 24 hours a day during March. Just like Professor Yamashita's lecture, it's safe and secure. Also, you can eat vegetables if you wash them. There are many people who still believe the message and eat vegetables after washing them. I worry about internal radiation for them. Professor Shunichi Yamashita of Nagasaki University appeared on an NHK program last night and said "Now the lessons from Chernobyl are about to be applied", as if Iitate-mura is his experiment. We're not his guinea pigs! Iitate villagers are tired. Increasing number of them now only listen to the words of the scholars who insists it's safe and secure. The villagers are weak. They want to find comfort in the words of the national government and the prefectural government that pushes safety. The price to pay for the safety without fact [truth] will be high. 24/7 streaming message of the duo that it's safe, it's safe, it's safe, trust us, just wash your hands and vegetables. Repeat the same message over and over again, and never mind that the message is not based on reality. Tell them what they want to hear. The subjects will get tired anyway and won't remember the details, but they will remember the message. The rate is a slight improvement in the latest week, up from 53% in the previous week. Wrong. According to TEPCO, as reported by Asahi Shinbun, the contaminated water INCREASED by 3000 tonnes in the latest week. TEPCO announced on July 27 that the operating rate of the water treatment system at Fukushima I Nuclear Power Plant that treats highly contaminated water remained at less than 60% for two weeks in a row. It's been a month since the "circulation injection cooling system" which uses the treated water to cool the fuel in the reactors, but a series of troubles has caused the operating rate to be far below the target rate of 90%. If the rate remains low, the plan to reduce the amount of contaminated water to zero by the year end will be in jeopardy. According to TEPCO, the operating rate for the week ended on July 26 was 58%, not much improvement from 53% of the previous week. The operating rate since the start of full operation is 63%, and the cumulative amount of treated water is about 30,000 tonnes. TEPCO had initially planned the operating rate in July to be 80%, but later lowered it to be 70%. The lowered target is not likely to be achieved. The company planned to raise the target to 90% in August, but has decided to keep it at 70%. The amount of contaminated water hasn't decreased as planned. With the rain from the typhoons and fresh water from the dam to supplement the treated water when the water treatment system was down, the total amount of contaminated water increased by 3,000 tonnes to 120,650 tonnes. The Central Waste Treatment Facility where the contaminated water is being stored is also reaching the capacity. At this point, TEPCO must be hoping and praying that Toshiba's SARRY (photo below) will deliver, once operational in early August. With the lack of workers and the high radiation level inside the Central Waste Processing Facility, TEPCO may not be able to unclog the pipes in AREVA's system. TEPCO released the video of the robot "Quince" going inside the Reactor 3's reactor building on July 26. No information released yet on the effort by human workers on July 27. According to tweets by a worker at Fukushima I Nuke Plant, TEPCO seems quickly running out of workers with low enough cumulative radiation, as the work these days has to be done inside the reactor buildings with very high radiation. He says TEPCO and the government are not involved in hiring of the workers at all, and it is left to the subcontractors to find workers. But they are having a hard time finding workers willing to work in an environment where they will reach the annual radiation limit in 2 weeks (I hope he's not talking about 250 millisieverts/year emergency limit) for an increasingly lower pay as the middlemen take cuts. "Robots may be able to go in and measure radiation, but the actual work has to be done by humans." "Since all the elevators inside the reactor buildings have been destroyed, we have to carry everything up the stairs on foot. If I climb slow, I'll get more radiation. But if I climb fast, I'll be tired out quickly. It's difficult to pace myself..."
The National Association of Chairpersons of Prefectural Assemblies held its regular meeting on July 27 and passed the resolution demanding Prime Minister Naoto Kan to resign so that the trust in the government is restored. The National Association of Chairpersons of Prefectural Assemblies held its regular meeting on July 27 and passed the resolution by majority demanding Prime Minister Naoto Kan to resign. The resolution was jointly proposed by the chairpersons of the prefectural assemblies in Iwate, Miyagi, and Fukushima which have been hit hard by the March 11 earthquake/tsunami disaster. The resolution criticizes the prime minister over his remarks on the earthquake/tsunami disaster and the Fukushima I Nuclear Power Plant accident for his "haphazard response, series of remarks and actions which have greatly impaired the trust of Japanese people in their government" and calls for his early resignation. Prime Minister Kan shows no sign of resigning any time soon, once he duped the super-naive ex-prime minister Hatoyama and used him to destroy the momentum for the vote of no confidence (which was really set to pass with bi-partisan support). On the contrary, Mr. Kan says he's been so inspired by the win by the Japanese women's soccer team in the World Cup, and that he learned from the team "never to give up". What's interesting about this mostly ceremonial resolution is that it was jointly proposed by the three prefectures where the national government's money (i.e. Japanese taxpayers' money) will rain in the government's effort to "recover and reconstruct" after the earthquake/tsunami/nuke accident. Fukushima is to become the radiation research capital of the world. Miyagi and Iwate are to become the "food factory" for the rest of Japan, with farming and fishing organized into some corporate structure, with people living in "ecotowns" created by shaving off the top of the mountains so that they are safe from tsunami. A grand vision, and the governors there, particularly the Miyagi governor, are thinking in the similar vein. But their assembly chairpersons want PM Kan to go. That does not add up, does it? It looks more like another pressure tactic to get more of what they want, which is more money from the national government and sooner. And if they really think PM Kan and the national government are alone in causing the trust in the government to erode fast in Japan, I don't know what to say. A resident in Akita Prefecture alerted the authorities when the bag of leaf compost that he purchased from a local garden/home center measured high in radiation with his portable survey meter. The authorities tested the content of the bag, and it had 11,000 becquerels/kg of cesium. At the garden/home center (2 locations) the air radiation 1 meter from the pile of the leaf compost bags measured as high as 0.48 microsievert/hr. The press release is somewhat misleading, as it says the air radiation 1 meter from one bag of the leaf compost is 0.06 microsievert/hr. If you measure in front of the pile of the same bags, the radiation is as high as 0.48 microsievert/hr. Akita's air radiation level (which the prefectural government measures only at 2 locations) is between 0.04 and 0.06 microsievert/hr. According to Yomiuri Shinbun (7/27/2011), these bags were packed in Tochigi Prefecture, and 20,000 bags have already been sold in Akita Prefecture alone. Shimotsuke Shinbun (local Tochigi paper; 7/27/2011) reports that Tochigi Prefecture tested the leaves that went into the leaf compost bags, and they found 72,000 becquerels/kg of radioactive cesium. The leaves were collected in the northern Tochigi in April, and was sold outside the prefecture from mid June to early July. The Tochigi prefectural government ordered the two sellers of leaf compost in Tochigi to recall what's been sold and refrain from shipping "voluntarily" (i.e. at the sellers' own cost, with no support from the government). Leaf composts are mainly used by the home gardeners. There may be many who hoped to grow their own, radiation-free vegetables and bought these bags to amend the soil for better growth of the seedlings. Well, that hope is dashed. The home gardeners may have ended up contaminating their own soil which may not have been contaminated before they put in the compost. The Ministry of Agriculture, Forestry and Fisheries couldn't even figure out that cattle farmers feed their cows with rice hay. What the individual home gardeners use for their small gardens was probably none of their concern, as the Ministry is there for the producers. From TV Asahi's "Hodo Station" on July 26, in the segment that discusses the lifetime limit of 100 millisieverts radiation. Disappointed, the farmer says, "I don't know what to say to my customers. It's much lower than the provisional safety limit in Japan, but if I compare the number to the safety limit in Ukraine it is extraordinary..."
The reporter asks the farmer, "What is the safety limit in Ukraine?" The man who runs the station says, "For these farmers, the provisional safety limit in Japan is just too loose." The Japanese government's mishandling and concealing the radioactive fallout information has resulted in radioactive water, vegetables, fish, mushroom, beef, hay, pork, manure, compost, and now eggs. And the farmers like this chicken farmer who clearly wants to sell only "safe" eggs to his customers are at a loss. To the chicken farmer, 60 becquerels/kg was just too high to sell his eggs in good conscience. so that TEPCO can conserve water that is being injected into the RPVs. The robot "Quince" went to the 2nd floor of Reactor 3's reactor building at Fukushima I Nuclear Power Plant on July 26 and measured the radiation. It was as high as 75 millisieverts/hour on the 2nd floor. To help "Quince", 6 TEPCO employees went to the reactor building (I don't think they were inside the building), and received maximum 2.22 millisieverts of radiation. No radiation level is too high for carbon-based workers in the time of crisis, and TEPCO is sending 6 of them up the stairs to the 2nd and 3rd floors of Reactor 3 on July 27. However, the amount of time the workers spend inside the reactor building will be limited, according to TEPCO. The workers are to conduct the survey to determine whether it is possible to hook up the water injection system to the ECCS (emergency core cooling system) pipe, so that the water could be poured directly over the melted fuel (if there's melted fuel left in the RPV, that is) and thus more efficient (i.e. using less water) in cooling the fuel. Here I thought they'd been injecting water directly above the melted fuel or where the fuel had once been. Either they tell us now, or it occurred to no one to ask in detail how the fuel was cooled. TEPCO announced on July 26 that the company started the work to change the method of water injection in order to cool the fuel inside the Reactor 3 more effectively. The Japanese-made robot "Quince" went inside the reactor building to investigate whether it was possible to use the pipe that could feed water closer to the nuclear fuel. In Reactors 1, 2 and 3, the cooling water is being poured outside the core shroud to lower the temperature of the fuel. The method is adequate in Reactor 1 and 2 with about 4 tonnes/hour water injection, but in Reactor 3 this method of cooling is not efficient enough, and it requires 9 tonnes/hour water. As the result, more contaminated water is being produced, and the company was looking for an alternative method of cooling. TEPCO is considering using the ECCS (emergency core cooling system) pipe which can pour water from above the fuel. On July 26, the company sent the robot "Quince" to the 1st and 2nd floors of Reactor 3 building to take pictures of the pipe, and started measuring the radiation levels to see if workers could enter the building. As far as TEPCO is concerned, the melted core is still inside the RPV in Reactor 3. The video of his July 25 tour of the crippled plant has been uploaded by the IAEA. As they approach Reactor 3, the survey meter keeps beeping, alerting them to a high radiation level even at that distance (about 1:32 into the video). Devastation from tsunami looks just as bad as in the earlier videos (about 2 minutes into the video). Toward the end of the video, the survey meter shows "88.3". I suppose it is in microsievert per hour. The head of the Agency for Natural Resources and Energy, under the Ministry of Economy, Trade and Industry (METI), met with the chairman of the Chamber of Commerce in Fukui Prefecture to plot the strategy to press the governor of Fukui to agree to re-starting nuclear power plants in Fukui. The Chamber of Commerce chairman is one of the biggest supporters of the governor. The Agency for Natural Resources and Energy disclosed on July 25 that it was the Director General of the Agency, Tetsuhiro Hosono, who met with the head of the Fukui Prefecture Chamber of Commerce Tatsuo Kawada. But the Agency said it didn't know whether the director general had solicited Kawada's help in persuading the governor of Fukui, Kazumi (Issei) Nishikawa, who has refused to re-start the nuclear power plants [in his prefecture]. Mr. Kawada revealed on July 24 in a general meeting in Fukui City for Hokuriku Shinkansen (bullet train) promotion for Fukui Prefecture that he met with a high-ranking METI official on June 24, right after Banri Kaieda, Minister of Economy, Trade and Industry issued the "safety declaration" for the re-start of the nuclear power plants. Kawada said he was asked during the meeting to cooperate in re-starting the nuke plants [in Fukui Prefecture], with the official saying "we will make sure your request [for the re-start] will be expedited". Mr. Kawada didn't disclose the name of the official. The public relations department of the Agency admits there was a meeting between the two, that "Mr. Kawada pressed Director General Hosono for the Hokuriku Shinkansen project during the meeting". Mr. Kawada also serves as the chairman of the Fukui Prefecture Keidanren (Japan Business Federation), and is the largest supporter of Fukui Governor Nishikawa. Governor Nishikawa, a career bureaucrat from the Ministry of Home Affairs (now the Ministry of Internal Affairs and Communications) before becoming the governor of Fukui in 2003, may be against the re-start without concrete assurance from the national government as to the safety of the nuclear plants, but he has been pushing hard for the Hokuriku Shinkansen project (to extend the line at least to Tsuruga City in Fukui) which would greatly benefit his prefecture. Give and take. Will the governor be persuaded by the Hokuriku Shinkansen? In the meantime, in the meeting of the Nuclear Safety Commission on July 25, the Mayor of Tsuruga City in Fukui Prefecture was newly appointed as a commissioner in the nuclear disaster counter-measures subcommittee of the NSC. He and another bureaucrat from the Aomori prefectural government (also newly appointed on July 25; Aomori is where the Rokkasho Reprocessing Plant is located) are the only two government people appointed to the subcommittee; the rest are the researchers at government and private nuclear research institutions. The area along the Wakasa Bay in Fukui Prefecture is called "Genpatsu Ginza (nuke plant high street)" with total of 15 nuclear reactors in 5 nuclear power plants. 4 reactors are located in Tsuruga City alone at Tsuruga Nuclear Power Plant (with 2 reactors), the Fast Breeder Reactor Monju and the Advanced Thermal Reactor (ATR) Fugen (being decommissioned).